Articolo in lingua inglese del collaboratore prestigioso Fisico e climatologo UK Dr.Clive Best pubblicato sul suo blog http://clivebest.com/blog/?p=7278 dove presenta la nostra ricerca climatica mondiale unica nel suo genere, sulla correlazione fra Tides e Jet Stream, con l'importantissima scoperta di anticorrelazione fra picchi gravitazionali e valori della Artic Oscillation, sotto la direttrice del Polar Vortex JS., con un propagamento di effetto del JS sotto i picchi della forza gravitazionale da 1 a 5 gg. Una grande soddisfazione personale di avere finalmente la ricerca con una pubblicazione scientifica a livello mondiale sulla rivista internazionale peer review IJEGE della UNiversità la Sapienza di Roma(Scienza della Terra). Una ricerca scientifica sul clima e la meteorologia la prima al mondo pubblicata sulla correlazione fra forza gravitazionale (Tides) e componente a getto (Jet Stream). Preamble: Our paper has finally been published in Italian Journal of Engineering Geology and Environment. It proved to be controversial with ACP, but I am 95% certain that lunar tides affect both weather and medium term climate. Variations in the Polar Jet Stream directly affect weather across Europe and North America (Francis et al., (2012)). Jet Stream dynamics are governed by the development of planetary Rossby waves (Dickinson, (1978)) driven by variation of the Coriolis force with latitude. Here we show that increasing atmospheric tides can induce the development of Rossby waves, especially during winter months. This changes the flow and position of the Jet Stream, as measured by the Arctic Oscillation (AO) (Higgins 2002). Although horizontal tidal forces are tiny (107 smaller than gravity), they act over vast areas dragging the Jet Stream flow southwards in regular pulses as the earth rotates. This induces a changing Coriolis torque, which then distorts the Jet Stream flow. The data from eight recent winters are studied indicating that the AO is anti-correlated to the horizontal “tractional” component of tides acting between latitude 45N and 60N. The observed 28 day cycle in Jet Stream flow and extent has a statistical significance > 99%. 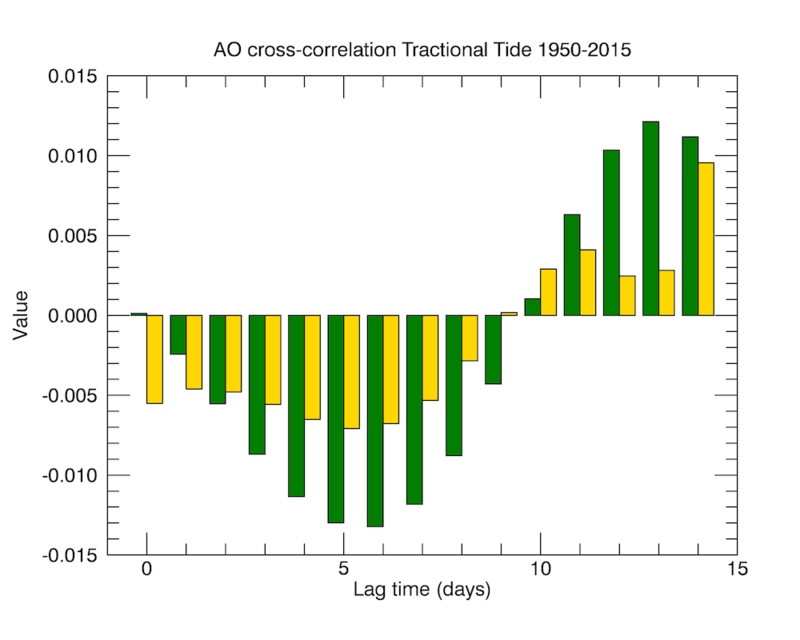 A cross-correlation between all daily AO data since 1950 and the tractional tidal strength shows a small but statistically significant anti-correlation with a lag time of ~5 days. The strongest correlation and largest excursions of the AO are observed during winter 2005/6 – a maximum lunar standstill year. This declination dependence of tidal forces at high latitudes is the proposed cause of many previous reports of an 18.6-year dependence of continental rainfall and drought (Currie, 1983/84). Varying tidal forces act both on the oceans and atmosphere particularly at high latitudes. A detailed study (Lindzen, 1981) of atmospheric tides finds that gravitational lunar tidal winds are more important at high altitudes. The horizontal or so called “tractional” component of net tides is responsible for tidal currents in the ocean and for tidal winds in the upper atmosphere. During northern winters the Jet Stream strengthens and shifts northwards. Meanders or Rossby waves (Dickinson 1978) develop near the eastern edges of continental landmasses and oceans. Solar insolation falls each winter to zero inside the Arctic Circle and consequently the diurnal solar ‘expansion’ tide disappears over Polar Regions. Gravitational atmospheric tides now dominate near the poles. There are two ‘spring’ tides each sidereal month, namely that coincident with the new moon and that coincident with the full moon. Seasons modulate the difference between both spring tides depending on latitude. The larger the latitude the larger is the asymmetry during the summer or winter solstice. At the equator both spring tides are always equal, but for the northern hemisphere the new moon tide is largest during winter, whereas that coincident with the full moon is largest during summer. Twice a year at the spring and autumn equinoxes both spring tides are approximately equal at all latitudes. This seasonal change causes a 6 monthly phase shift of ~14 days in the maximum tractional tidal force. Superimposed onto this is an 18.6 year cycle of the lunar precession which modulates the latitude dependence of this amplitude. The tractional tidal force therefore varies in magnitude, latitude and time, and so is not a single frequency harmonic. Winter storms in the North Atlantic form at the interface where warm Gulf air meets cold Polar air near Newfoundland. This temperature gradient produces baroclinic instability spawning storms that move westward across the Atlantic. The track of these storms follows the Jet Stream and their impact on Europe depends both on their strength and the relative position of the Jet Stream (Francis, 2012). Previous studies (Currie, 1983, Agosta, 2014, Currie, 1934, Clegg, 1984) have shown an 18.6-year cycle in rainfall across large continental zones implying a dependence of storm formation on the lunar precession. Others have speculated about a tidal influence on climate over decadal timescales (Ray 2007). Changes in lunar declination through the 18.6-year cycle mainly affect the strength and sidereal rate of change of tidal forces with latitude. The cold winter of 2010 resulted from a Jet Stream positioned below the UK drawing cold air down from the North and East. A negative value of the North Atlantic Oscillation (NAO) is related to a negative AO (Thompson, 1998) and corresponds to a low-pressure difference between the Icelandic Low and the Azores High resulting in a weaker Jet Stream with larger meandering loops. This allows cold air to spill down from the Arctic and Siberia into mid latitudes. During the winter of 2013/14 a strong Jet Stream was positioned directly over the UK and a string of powerful storms caused extensive coastal flooding. It was striking how several of these storms also coincided with high spring tides, for example those of December 5th 2013 and January 5th 2014. [RA Madden 2007] identified a free Rossby planetary wave mode with a 28-day period during Northern Hemisphere winters in NCEP/NCAR reanalysis data. He also noted that all such free waves need “some kind of excitation in order to exist in the face of dissipation by radiation and friction”. Could gravitational tides in the atmosphere be responsible? It is the horizontal (tractional) component of tides that produces deep ocean currents and atmospheric pressure gradients in the atmosphere. Can these also disturb the Jet Stream flow? To investigate this possibility further, we have calculated the time dependence of tractional tidal forces acting at different latitudes using the JPL ephemeris (Standish, 1990) and then compared these to the Arctic Oscillation (AO). During northern winters the maxima of tidal forces occur at each new moon and their strength depends on the relative positions of the earth, moon and sun. Although these tractional forces are only about 10-7 times the strength of the earth’s gravitational acceleration g, they still dominate because they act perpendicular to and therefore unaffected by the earth’s gravity. These changing tidal forces sweep across the earth daily, generating a variable pull on the Jet Stream of several tons per kilometre. We have used the daily values of the Arctic Oscillation from 1950 to 2015 as calculated by NOAA (Higgins, 2002) as a measure of Jet Stream flow. Figure 1. Comparison of the Arctic Oscillation (AO) with tractional tidal forces acting at 60N(blue) and 45N(green) for the last six winters 2009-2014. 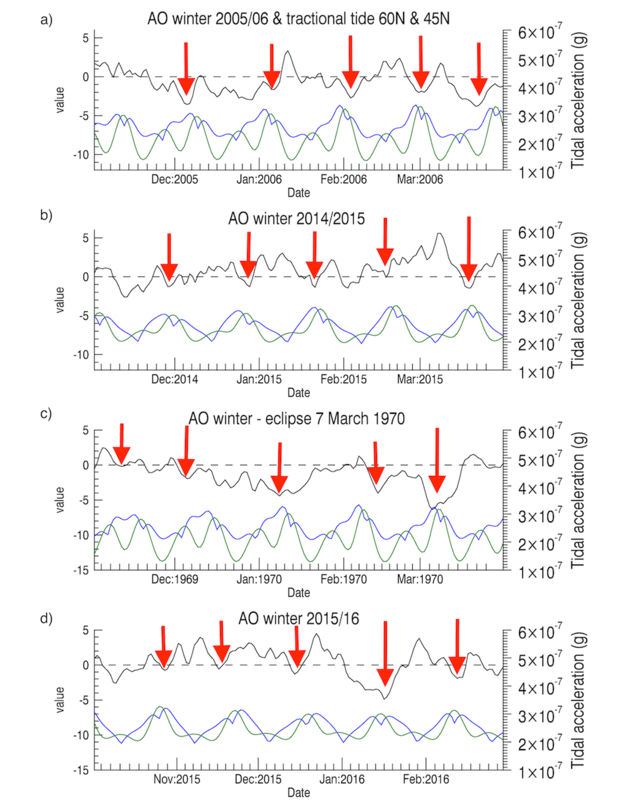 The red arrows show observed dips in the AO coincident with tidal maxima. Figure 1 shows the variation of the AO index compared to calculations of the tidal tractional forces acting at 60N and 45N for the last 6 winters. (see Appendix A for details). These results show a visual hint of an AO signal aligned with the lunar cycle, although it is not always consistent in time. The approximate 28-day cycle is still however rather striking. A calculation of the correlation between AO and tidal force at 60N gives a value of -0.2 between October 2009 and March 2010. To investigate further, we also looked at the recent maximum lunar standstill, which occurred in 2005/2006 and resulted in the largest monthly variations of tidal forces for Polar regions. If tractional tides affect the Jet Stream flow one would expect to see a maximum correlation between AO and tidal forces during the 2005/2006 winter months. Figure 2a shows the result. There are indeed large swings in the AO, which again appear anti-correlated with tractional tidal forces. In particular, the coincidence with the 45N component is striking. This apparent tidal effect may also provide an explanation for the many reports that rainfall and droughts in northern continents follow an 18.6-year cycle [3-5], since the path and strength of storms depend on changes in the flow and direction of the Jet Stream. In 2006 there were net swings of the AO index through absolute values of ~6 between consecutive new moons. Figure 2b shows the same results for the recent winter 2014/15, which included a total eclipse of the sun on March 20th coincident with the moon at perihelion (super-moon), resulting in exceptional high tides. This strong anti-correlation for two successive total lunar eclipses occurring at the March equinox is also striking. Such perfect alignment of the sun and moon bring the highest spring tides, especially with the moon at perigee. Figure 2. a) Variations in the AO which show an anti-correlation with the tractional tidal forces at 45N(green) and 60N(blue) during the Maximum lunar standstill (2005/6). b) A similar study for the current Winter 2014/15. A steep drop in AO is observed coincident with the solar eclipse on March 20. c) A previous total eclipse, which occurred on March 7 1970 and produced a similar steep drop in AO. Lunar declination in 1970 was near maximum. d) The current winter (2015/2016) up until the end of February 2016. The red arrows show dips in the AO coincident with maximum tractional tides. A large negative swing in the AO occurred in coincidence with the 2015 eclipse, with a regular anti-correlated beat beforehand. A very similar situation can be observed for the total eclipse, which occurred on March 7 1970, and which also happened to be near a lunar standstill (Figure 2c), where the effect is even more striking. Finally Figure 2d shows the current winter 2015/16 at the time of writing, which again shows the same pattern of negative AO at times of maximum tides. How statistically significant are these observations? Figure 3 plots the composite of the last 10 years of daily AO signal compared to calculated tidal forces. A pattern emerges of an underlying 28-day cycle but with irregular changes in phase combined with stochastic noise. This pattern becomes even more apparent when comparing the differential of the AO to tides that measures the rate of change. Figure 3. The last 10 years of daily AO data compared to tractional tidal forces calculated at 60N (black) and 45N (green). The greatest variance occurs during winter months. Figure 4 shows the 5-day averaged rate of change of AO (DA/DT) compared to the tidal traction force at 45N (T45) over a 65 year period. The differential calculated over 5 successive days avoids excessive noise. Maxima and minima of DA/DT tend to coincide with maxima and minima of the tidal force. The Spearman correlation coefficient calculated between all values of DA/DT and T(45) evaluates to 2.4%, which although small still deviates from zero (no correlation) by 3.7 equating to a statistical significance of >99.7%. Figure 4: A comparison between the differential of the Arctic Oscillation (DA/DT) as shown in grey with the tractional tidal force per unit mass at 45N in blue. The correlation between the two shows a positive correlation of 0.02 with a significance above zero of 3.7 sigma. As a further test a cross-correlation analysis was also performed between daily AO values, from 1950 to 2015, and the tractional tidal acceleration at latitudes for both 45N and 60N each day. This procedure calculates the correlation coefficient between both signals as a function of the time lag ‘n’ between them by systematically shifting one of the series by n-days. Both time series cover well over 23,800 daily values. Figure 5 presents this cross-correlation as a function of the tidal lag time. There is again a small, yet still statistically significant, anti-correlation of the AO which peaks at a time lag of ~5 days with the tides. The effect is strongest for the 45N component. Figure 4: Cross-correlation of the Arctic Oscillation with tractional Tidal acceleration since 1950. The green values are for the tractional acceleration at 45N and the gold values are those for 60N. Both show a small anti-correlation to the AO with a time lag. The 45N component in particular shows a lag time peaking at 5 days. By comparing lunar cycles with AO between December and the end of March from figures 1 & 2, one can make a further estimate of the statistical significance in winter. If there is no effect then we can assume that each tidal maximum would coincide with either a dip or a rise in the value of AO. Then we would expect a distribution of dips similar to simply tossing a coin. However some 46 out of 56 lunar cycles in figures 1&2 show a visible drop in the value of the AO, coincident with maximum tidal traction, as indicated by the arrows. The probability of this occurring by chance is . Maxima in tidal traction mainly shift the AO towards negative values, which then relax during tidal minima. The three lines of evidence therefore for the statistical significance of these result are as follows. Correlation coefficient of maximum rate of change of AO with maximum tides over 65 years of 0.024 with statistical significance of 3.7 ? above zero. 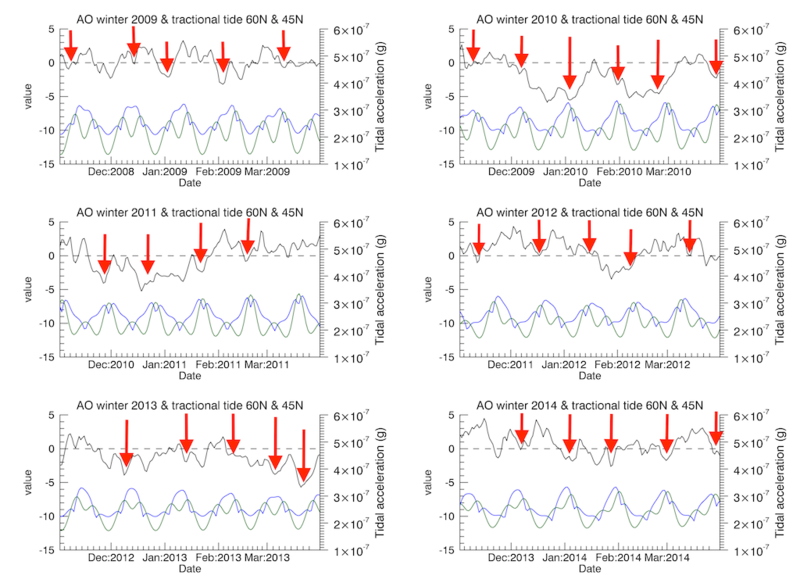 A coincidence of declining values of AO with maximum tractional tides for 10 recent winters. The probability of this being a random occurrence is ~0.5×10-6 . These results show that it is extremely likely that there is a tidal influence on the Polar Jet stream flow. The strongest effect occurs, on average, 5 days after a major spring tide and during winter. The absolute values of the anti-correlation are small but the observation of such a continuous signal over 28,300 daily values is still statistically convincing. The evolution of the Jet Stream and generation of Rossby waves is an immensely complicated process. Winter weather in the northern hemisphere is dominated by the strength and flow direction of the Jet Stream. The intensity of flow varies from one year to another. The Arctic Oscillation is just one scalar measurement of this evolution. Despite this, we have demonstrated that there is strong statistical evidence of a small sidereal tidal effect on the AO, especially during winter months. Strong atmospheric tides increase the southward drag on the Jet Stream generating a Coriolis torque as the tides sweep east-west around the rotating earth, and play a role in triggering storms. It is noticeable how many of the damaging UK winter storms of 2013/1411 also coincided with high spring tides. The total effect depends both on the maxima and on the rate of change of the tractional tidal component. These both vary within the 18.6-year lunar precession cycle. Ocean tidal variation may also indirectly affect surface pressure and therefore AO. However, this possibility cannot be isolated as it is in phase with any direct effect from atmospheric tides. The work reported here provides strong evidence that increasing tractional tidal forces can change the direction and speed of the Jet Stream, especially during winter months with a lag time of about 5 days. It is therefore proposed that the accuracy of medium-range weather forecasting could be further improved by including quantitative gravitational tidal forcing terms into Global Circulation Models. The tractional (tangential) tidal force at any point a whose position vector subtends an angle ? 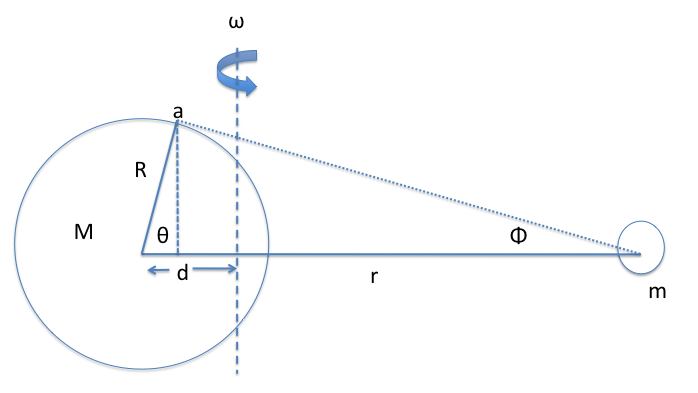 to the lunar position vector r is defined as follows. However for finite angle the tidal force acquires a vertical component. The tractional component (parallel to the surface) can be calculated using the JPL ephemeris to derive the net lunar-solar tidal vector for any given date and time. All computer software used is available from the authors on request (see also supplementary information). Richard D. Ray, 2007: Decadal Climate Variability: Is There a Tidal Connection? J. Climate, 20, 3542–3560. Thompson, David W. J.; John Michael Wallace (1998). “The Arctic oscillation signature in the wintertime geopotential height and temperature fields”. Geophys. Res. Letters 25 (9): 1297–1300. Madden, R. A. (2007) Large-scale, free Rossby waves in the atmosphere – an update, Tellus, 59A, 571-590.